Stephanie Smith is an Atlanta-based artist, printmaker and educator creating expressive woodcuts and linocuts of narrative and symbolic images. She earned her B.F.A from the Atlanta College of Art and received a M.F.A. with Distinction from the University of Georgia. Stephanie is a Senior Lecturer at the University of West Georgia where she teaches Drawing, Design, Printmaking, Book Arts & Letterpress as well as serving as Gallery Director. She is actively involved in education and has a range of teaching experience including community education at the Atlanta College of Art and Chastain Art Center. 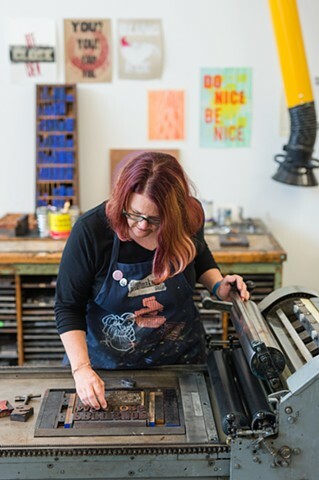 These experiences, the wonderful people she worked with, and a passion for the medium of printmaking inspired her to co-found the non-profit arts organization, the Atlanta Printmakers Studio in 2005. After serving for 5 years as President of the Board of Directors she continues to serve on the board and volunteers her time at the studio. Recent projects include curating the exhibition Departures: Out of the Frame-Off the Walls at Eyedrum Gallery for the 2017 SGCI printmaking conference and being selected for a Decatur Seed Grant for her print installation The Creative Act. Stephanie has received numerous grants and awards, including multiple artist residencies at the Hambidge Center for Creative Studies in Rabun Gap, GA and in 2003 was awarded a KBFUS Cultural Exchange Grant and traveled to Belgium, Holland, and France. While in Belgium she was an artist in residence at the Frans Masereel Centrum where she completed several prints. Her work can be found in many public and private collections. My work is concerned with narrative and symbolism. It is an investigation of images of personal significance and an attempt to translate the personal into a universal reading by using symbols and metaphor. Visual storytellers Lynd Ward and Frans Masereel, as well as comix and graphic artists are an influence in much of my work. The visual iconography of medieval woodcuts and altarpieces serve as inspiration and a system of communication based on images and commonly understood symbols as opposed to reliance on the written word.